Twelve years sit between Ashlyn and her next siblings. I parented through more than half her childhood and nearly survived the middle school years before adding more kids to the mix. 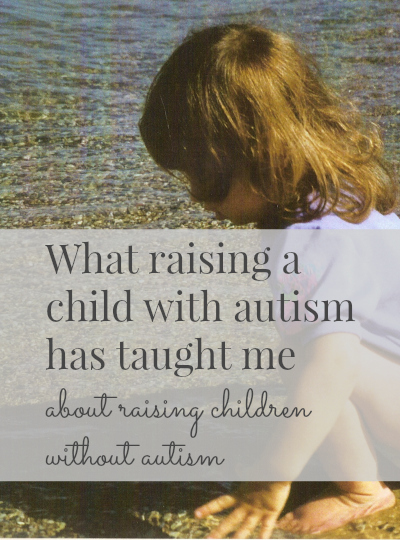 Raising a child with autism before parenting her siblings who do not have autism taught me a few things I hadn’t expected. 1. Including others is our job. It is not just “nice” to include the kids who don’t have someone to sit next to or might not get a birthday invite, it is necessary. I still remember how painful it was to watch my own daughter alone in a crowd, whether she realized it or not. Her siblings will not contribute to that feeling in someone else. 2. Everything happens in its own time. Once I ruled out the fact we were not dealing with any more autism diagnoses, I was so much more relaxed about when my younger kids potty trained and said their r’s correctly. Kids do not need to follow the developmental chart by the month, day and minute BUT if they are lagging behind too far in more than one area RUN to that developmental pediatrician for an evaluation. 3. Being different is much more interesting than blending in. I was a blender-inner as a kid. I never wanted to do a thing that would make me stand out in a crowd. Following on the tails of my oldest, who does what she wants and speaks whatever is in her mind, has been a refreshing lesson I needed. Having Ashlyn has taught me to cheer when my kids stand out rather than sigh with relief when they fit in. 4. There is a place for everyone. The academic struggles have already begun with my younger kids but Ashlyn gave me a crash course in piecing together what works and running with it. She may not be able to go to college but she will be a contributing member of society and her siblings will too, regardless of their first grade reading fluency scores. 5. Happiness is not overrated. Ashlyn’s smile has taken her farther in life than any goal I ever set for her in a school meeting or an occupational therapy session. I want my children to do well and reach their dreams but so much more than that, I want them to be happy people. 6. Kindness wins. Teenage girls are not always the nicest bunch but Ashlyn’s mind does not work that way. She does not understand the motives behind gossip or why you would judge someone’s outfit and you know what? This is the way to live. She made it through high school with a lot of fans because how can you not like that person who accepts you no matter what? I wish I had learned to behave this way before my own rocky road through adolescence and the teen years. 7. If it doesn’t exist you make it happen. No place for your developmentally delayed kiddo to play soccer? No social skills group just for girls? Find a few other like-minded parents and make it happen. It doesn’t have to be fancy or perfectly organized, it just needs to exist. Waiting for the right things to come along for your kids is the quickest way to ensure they never come along. 8. Trust your instincts. If you know in your momma-gut that something isn’t right then something isn’t right. Just because a doctor or therapist gives you a diagnosis, opinion or recommendation, their credentials alone don’t make them more knowledgeable about your own child than you are. You are the parent and that gives you a degree all your own. It is okay to challenge what the experts think, you’ve got a doctorate in motherhood, even when it doesn’t feel that way. Unfortunately, there’s no official manual on parenting but if there was, this post would definitely be included. Having The Kids home(ish) schooled and living in a rural area half the time and in a foreign country the other half, I need to work more on #7 and creating opportunities for them and myself. I can relate to so much of this, I too have a son with autism, he is now 24 years old. He has taught us all in the family how life should be lived. Absolute and straight forward. There are so many hard things for moms to watch. I still step in as needed. I wont let him be overlooked or ignored because he doesn’t look like he is not paying attention. We do learn how to treat every one, because of our children and the ones who we deem need to most help. It is all good. Mama to three on earth and three in heaven. I love all of this so much, especially “Having Ashlyn has taught me to cheer when my kids stand out rather than sigh with relief when they fit in.” I still need to learn this, and Slim shows me this all the time. He’s so okay with who he is, and people love him for it. I have to stop being embarrassed by his different-ness and not be scared that the other boys will be different. I love all of these. My son is in an ‘inclusion’ preschool program and I love seeing at this age how including everyone comes much more naturally. Thank you for having him in an inclusive room. It is great seeing them start so early and I think, when they do, they don’t grow up seeing so many differences.